Milanese newspaper article from session 25 of YSDC's version of the Horror on the Orient Express campaign. Milanese newspaper article as used in session 22 of YSDC's version of the Horror on the Orient Express campaign. Another photograph of the Innsmouth House Players who went through Horror on the Orient Express. Clockwise from the left: Neil, Val, Fin, Helen and Claire. Fin from the Innsmouth House Players' game of Horror on the Orient Express. Second Milan newspaper handout for the Innsmouth House Players' game of Horror on the Orient Express. Val from the Innsmouth House Players' game of Horror on the Orient Express. A note from the Keeper of Horror on the Orient Express about the last episode of the campaign. 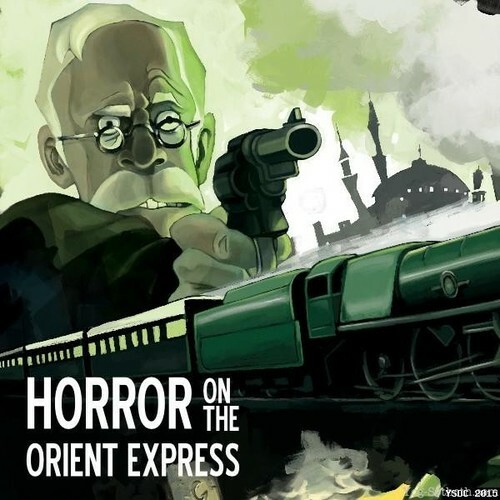 Contents of the Horror on the Orient Express campaign box from Chaosium. Advertisement for Panzer Luft Airways as used in the Innsmouth House Players' game of Horror on the Orient Express. Jim and Fin show the framed Horror on the Orient Express poster.